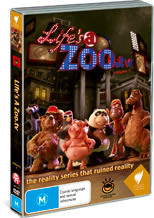 Take a foul-mouthed, obnoxious pig, a sassy feline, a confused creature from the orient, an out-of-place homosexual and more, and put them into an animated Big-Brother type house and you have Drawn Together.... oh I mean Life's a Zoo, an award winning Canadian stop-motion claymation situation-comedy featuring an eclectic group of animals thrown into a house with omnipresent cameras - the similarities with the aforementioned show are abounds, but Life's a Zoo will no doubt garner its own cult following as it is unique in its own way. The contestants are, as I have previously mentioned, animals and variations of stereotypes in reality tTV shows. There's Jake, the selfish Pig who is obsessed with winning the show. Jake is in love with Minou, a bulimic, jamaican Panther model who bears an uncanny resemblance to Naomi Campbell. Some of the other contestants are Chi-Chi, a ditsy Panda and Ray, the druggie, impulsive orangutan and Rico, the homosexual crocodile. The contestants are thrown into a gigantic house ("Somewhere in Saskatchewan") and each week, a contestant will be "extincted", leaving the winner to take the house. The episodes centre around the different challenges that the contestants are made to do (like stay awake or avoid a pyscho murderer) and the zany interactions amongst the contestants with overarching motivations, side plots, rivalries, love interests arcing their way through the episodes. The show is stylised around Big Brother-like sequences, with shots from hidden cameras and cut-aways from to interviews of the contestants in a interview room. Now, just to set the general tone, the humour varies from the pretty low-brow to reasonably, well written subtle one-liners, but on average, stays pretty close to the former. A couple of examples do come into mind. The first few episodes do have instances of Jake eating the proceeds of Minou's bulimia, which although is obviously bad taste, but is still quite amusing. Also, as a person of Asian background, I find Chi-Chi's constant references to Chinese Takeaway and her misunderstandings due to her ethnicity as an eye-rolling annoyance. It just doesn't seem to have the cutting-edge offensiveness of South Park nor the well-written plot of Drawn Together. The episodes though are still an enjoyable diversion. The challenges forced upon the contestants are genuinely varied and entertaining with some moments that are genuinely funny and amusing. In saying this, the contestants are self-centric individuals with strong, distinct personalities and they do not seem to gel together into an enjoyable spectacle but are more akin to a mish-mash, in a contest of whose personalities shout the loudest amongst the chaos. The animation style is different and eye-catching, using raw, unrefined clay models more akin to "The Trap Door" than Aardman. Each episode also contains a live-action music video edited into it, providing an enjoyable, although jarring and disjoint, interlude. The DVD also contains an extra feature of sequences of hand-drawn frames put side-by-side against the stop-motion animation. In conclusion, this DVD is an acquired taste but is still an entertaining diversion. It's no Drawn Together but if you're into that kind of thing and love claymation, give this a go.